Before the fall of the Soviet Union, the anniversary of the Bolshevik Revolution was one of the most important holidays on the Russian calendar. Today, on the centennial of the revolution, just 8% of Russians believe this event was the most important of the past century. 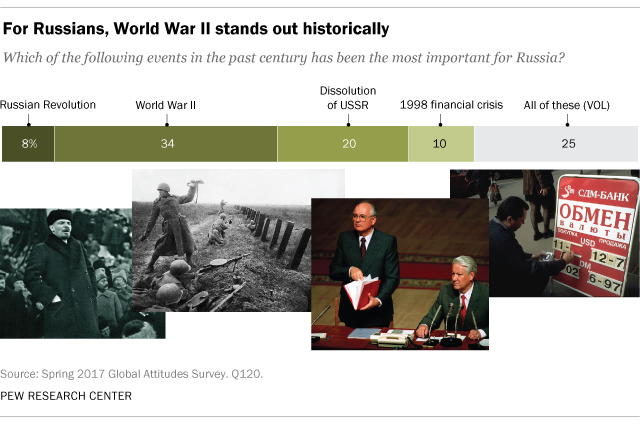 Instead, a plurality of the public (34%) sees World War II as Russia’s most important historical touchstone. After World War II, 20% of Russians rank the dissolution of the USSR as the single most significant event of the past 100 years. Just one-in-ten cite the country’s 1998 financial crisis. However, a quarter of the public volunteers that all four of the events tested were equally important historical developments for their nation. Views of events in Russia’s history differ by the level of confidence in President Vladimir Putin. 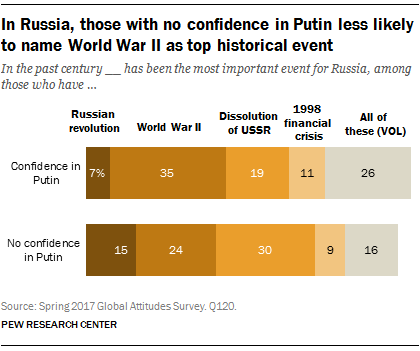 Russians who trust Putin to do the right thing on the world stage are more likely than those who express no confidence to name World War II as the most important event of the past century (35% vs 24%). This may reflect Putin’s efforts to promote the war as a defining moment for the Russian nation. Among the small share who express no confidence in Putin, the top historical event is the dissolution of the Soviet Union (30%), not World War II. Josef Stalin and Mikhail Gorbachev, the Russian leaders presiding, respectively, over World War II and the fall of the USSR, receive starkly different ratings in Russia. In a 2015 survey, a majority of the Russian public (58%) believed Stalin played a very or mostly positive role in history. Few people (22%) felt the same way about Gorbachev.